You have built an excellent software product and your customer base is expanding. As you grow, you realize that processing and collections functionality would nicely complement the features that you already have in your package and would greatly benefit your customers. You also feel the potential for residual revenue and you don’t want to lose this opportunity. The problem is you are not a payment processing guru and collections world is a dark and cold place for you. You like want you do and want to concentrate on your customers, but you feel that not getting involved is missing something important. UniPay may be what you are looking for. Extensive integration API will make communication between UniPay and your existing software systems an easy and hassle free process. Clean, user-friendly, web interface, as well as rich feature list, will certainly appeal to your customers. Using private branding capabilities of the software, as well as, payment processing and collections expertise of our partners can turn your software business in payment industry leader in no time. We, as a team, will help you define an appealing offer for your customers, and will assist you in building an integration and on-boarding strategy that fit well your existing infrastructure. We will work with our payment processing and collections partners to get the best offer for your customers and a generous residual commission for you. 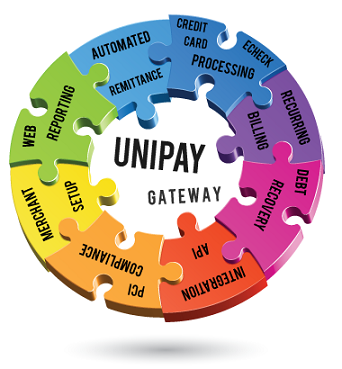 Contact us today to explore your options as UniPay allied Software Provider. Find out what payment processing solution will meet the requirements of modern software providers.